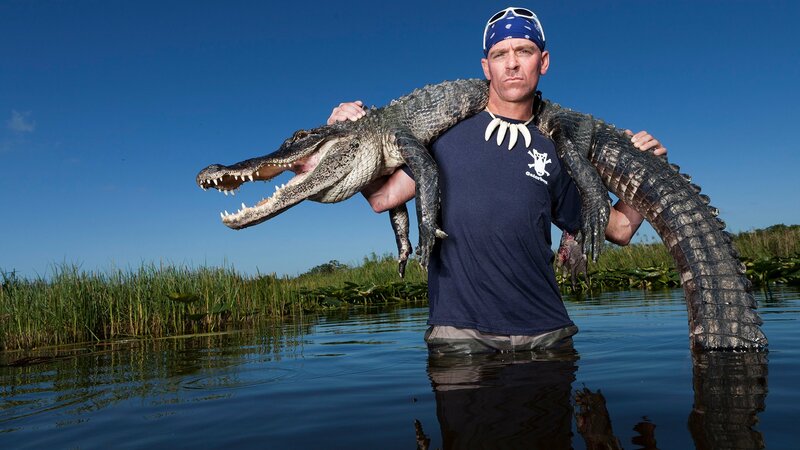 Meet Paul Bedard and Jimmy Riffle - two men who defy death capturing alligators with their bare hands. This series follows every crazy adventure and sticky situation the duo encounter. Paul and Jimmy are determined to capture an eight-toed alligator before it is killed by a rival trapper. Paul and Jimmy clash over Jimmy's goal to expand the Gator Boys Rescue Operation to include traveling alligator wrestling shows. During a hatchling hunt, an explosive mother gator is determined to fight to the death to protect her young. Torrential rains make the capturing gators hazardous; when Ashley endangers her life in the gator pit, Jimmy accuses Chris of poor training. Jimmy hits the road with the best volunteers, leaving Paul with only Scott to help him catch treacherous gators and snakes. Paul and Jimmy capture gators at a playground, a garage and a housing development. A gig with swimsuit models and alligators makes Paul and Jimmy worry about the company's reputation. A research project requires blood samples taken from a 600-lb. gator, but the window of opportunity is only three minutes. A triple-amputee veteran gets a chance to wrestle an alligator. Paul pulls a prank on Ashley and Chris; the crew have their hands full with four large gators. Jimmy's preoccupation with road shows and romance create friction with Paul, who attempts to rescue a gator buried under debris. The guys could lose their headquarters when the future of the Everglades Holiday Park is in doubt.